Wally, the owner of Scrapers R Us, contacted Website Adelaide for an update of the ecommerce shop /webiste. I rebuilt it and gave it a bit of a freshening up feel while updating the system and making it easy to work with, fast and smooth. While doing this we optimised for on-page SEO as much as possible with the content available. 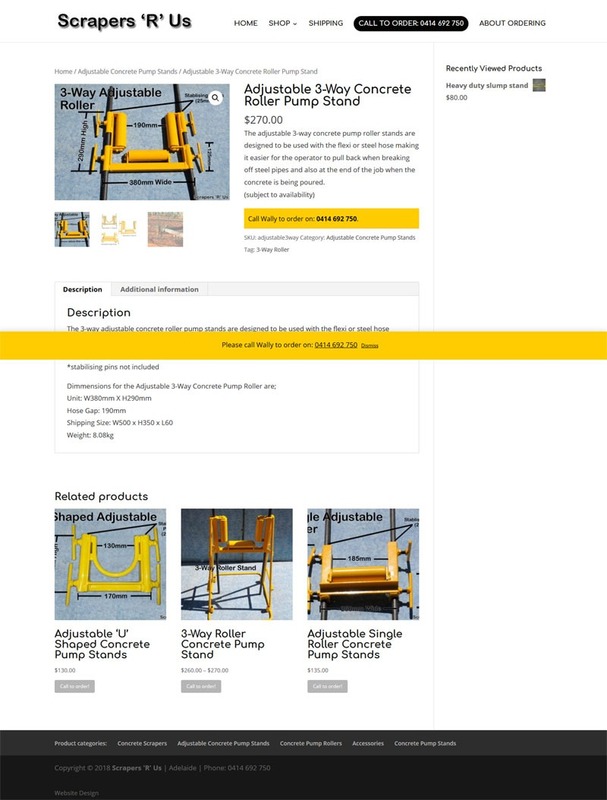 This is a Woocommerce website ready to be changed to order online if Wally should choose to. Today, there is a site wide message and a click button, “call to order” so Wally does not have to watch emails and worry about missing any orders. Scrapers R Us make concrete pump scrapers, stands and rollers for the concrete industry all over Australia. They are made here in South Australia by Wally and can be ordered and delivered Australia wide.